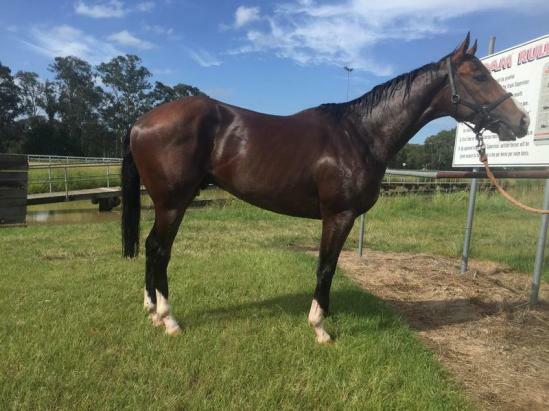 ROTHESAY (AUS) (Bay 2006-Stud 2011). 4 wins-1 at 2, Queensland Guineas, Gr.2. Sire of 121 rnrs, 57 wnrs, inc. SP Havasay, Too Good to Refuse, In His Stride and of Beloso, Kit de Luca, Jacksay - Fionesay (H.K. ), Oberland, Shadow Lawn, Shotacross the Bow, Lauderdale, Extrasay, Hannah's Wish, Hello Paris, Lasayette, Pacific Pearl, Rock de France, Rosewood Hill, Rothmoore, Says Me, Spiritos, Texas Rebel, Toronto Flyer, Social Vampire, Fogoso, etc. Upshot (g. by Stratum). 5 wins to 1300m, A$223,785, ATC Canterbury Park H., Share Care Respite Sprint H., NSW Tatt's RC Jim Beam H., 2d Canberra RC National Sprint H., L, ATC Tab.com.au H., Canterbury Park H., Illawarra TC AJ Bert Lillye Memorial H., 3d ATC June S., L, Starstable.com.au H.
Imagery (g. by More Than Ready). 5 wins to 1400m, BRC Glenlogan Park H., Racingjobs.com.au P., QHA P., Hardy Brothers H., Singapore TC Why Be H., 2d BRC Coca-Cola Amatil H., Singapore TC Class 3 H., 3d Singapore TC Class 3 H.
Shotacross the Bow (g. by Rothesay). 3 wins. See below. SNAPSHOTS (Success Express). 2 wins at 2, A$117,580, AJC Keith Mackay H., L, BTC Cafe 21 Winners H., 2d AJC Silver Shadow S., Gr.2, VATC Thoroughbred Club S., Gr.3, STC Australian Equestrian Team 2YO H., 3d STC Sweet Embrace S., Gr.3, Mona 2YO H., 4th NSW Tatt's RC Furious S., Gr.3, AJC Gimcrack S., L. Producer. Solebid. 9 wins from 1000m to 2100m, A$193,300, BRC Vittoria H., Beach House Bar & Grill H., Bundaberg Distilling Company H., Skyracing.tv H., Channel Seven Brisbane P., 2d BRC Mt St Michael's College H., 3d Rockhampton Cup, BRC Redpath Golden Jubilee H.
SEA SIREN (Fastnet Rock). Champion Older Female Sprinter in Ireland in 2013. 7 wins to 1350m, €43,275, A$1,681,830, BTC Cup, Gr.1, BRC Doomben Ten Thousand S., Gr.1, MVRC Manikato S., Gr.1, ATC Light Fingers S., Gr.2, Fairyhouse Belgrave S., L, ATC William's Premium Lager H., Vinery Stud H., 2d VRC Patinack Classic, Gr.1, BRC Doomben Ten Thousand S., Gr.1, ATC Surround S., Gr.2, Tipperary Fairy Bridge S., Gr.3, 3d Curragh Phoenix Sprint S., Gr.3, ATC Styletread.com.au H.
ORACY (Zabeel). 7 wins from 1450m to 1800m, R1,285,000, Turffontein Dingaans H., Gr.2, Gauteng Guineas, Gr.2, London News S., Gr.3, Racing Association Pinnacle S., Racing Association Allowance P. Sire. THE LADY (Stravinsky). 3 wins-2 at 2-at 1100m, 1600m, NZ$97,450, Waikato RC Star Way S., L, Counties Challenge S., L, ARC DA Peake P., 2d Avondale JC First Sovereign Trust 2YO S., Waikato RC Esker Lodge 2YO H., 3d ARC Eclipse S., Gr.3, BOP RC Oak Tree Restaurant Greerton 3YO P. Producer. ORATORIO (Stravinsky). 4 wins-3 at 2-at 1000m, 1200m, A$511,550, MVRC CS Hayes S., Gr.3, BTC Tommy Smith Slipper S., L, MVRC St Albans S., L, SAJC Magic Millions Adelaide 2YO Classic, 2d MRC Blue Diamond Prelude (c&g), Gr.3, Wyong RC Strawberry Hill Slipper, 3d MRC HDF McNeil S., Gr.3, Debutant S., L, 4th GCTC Magic Millions 2YO Classic S., L. Sire. DISCORSI (Galileo). 2 wins-1 at 2-at 1400m, 1600m, A$119,215, VRC Gibson Carmichael S., L, 2d MRC Barfleur H., Shannon H., Beer Street H., Mornington RC Aspect Skincare H. Sire. CHABAUD (Lookin at Lucky). 4 wins from 1200m to 2500m, A$213,145, in 2015-16, SAJC South Australia Fillies Classic, Gr.3, TTC Tasmanian Oaks, L, MVRC William Hill H., 2d Ballarat TC Racing.com H., 3d MRC Premier Signs H.
Race Record: 18 Starts 3-0-1 A$124,650. 3 wins-2 at 2-at 1200m, 1400m, A$124,650, to 2015-16, SCTC Rent to Own Cars 2YO H., 3d Toowoomba Guineas, 4th BRC Gunsynd Classic, Gr.3, GCTC Vo Rogue P., Gr.3.